The WCCP redirection protocol is quite complex to setup and a lot of things may go wrong. The following troubleshooting hints may help to correctly configure it. 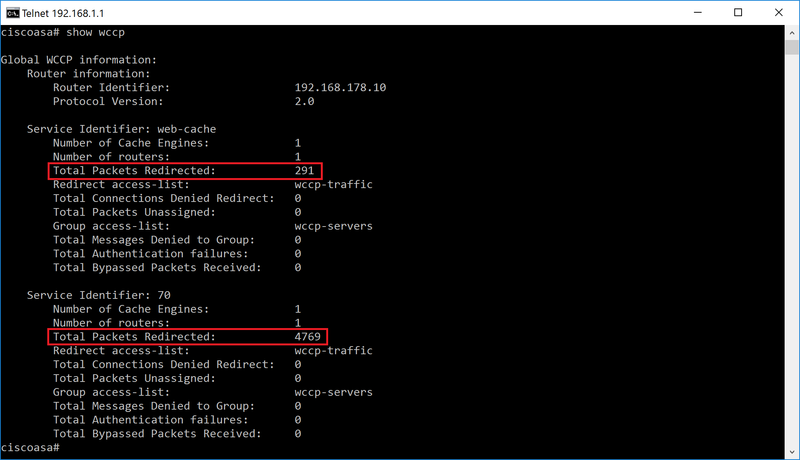 Commands to check the status of WCCP redirection on Cisco ASA side are show wccp. Correct output should look something like. The following command will help to capture GRE traffic from Cisco ASA to proxy box tcpdump -i ens160 -s 65535 -w gre.dump to file gre.dump that can later be analyzed with WireShark. Please note here the local ethernet NIC is called ens160. Yours might be different!